I visited a church recently, one that is fairly prominent in the city it’s in. There were people from all different walks of life, of many different ethnic backgrounds, and the musicians were good. People were raising hands and singing at the top of their lungs and everyone seemed into it. And then toward the end of the third song, something dawned on me. Not once during the three songs was Jesus mentioned. The cross wasn’t brought up. Sin and redemption and the love of Christ were nowhere to be found. We sang two more songs before the message, and the theme of every song was, “I’m going to get through this. God is going to lift me up.” God was a coach, someone to help walk you through the difficult times in life. And you know what? You can do it! Jesus was nowhere to be found. Worship through music is a big part of most church services, whether it be through a pipe organ or a rock band. Music moves us in certain ways; scientists have done many studies and tests to try to figure out why music affects our emotions so, without any definitive answers. Every known human culture uses music and song to communicate, and it can’t be by accident! We’re wired to enjoy music, and it’s one of the many ways we offer worship to God. I’m no stranger to worship music: I led the worship team at my home church all through high school, was heavily involved in leading with our college ministry, and was the worship director at a church for a year and a half after college. I come from a church tradition that highly values and emphasizes worship through song and music, and so that scene is a very familiar world. I’m picky now when it comes to worship music. Someone once complained that I didn’t do enough new or different songs, that my song database was too small. When it comes to leading congregations, I think worship leaders must use discretion when choosing songs. Think about your church service last Sunday. Can you remember the preacher’s main points? What Bible passage was he expounding on? It’s a bit difficult, isn’t it? Now think about what songs you sang. Can you remember one or two of those? The reality is, at the end of the week, people will be more likely to hum a song they sang at church than to ponder sermon points. I found myself just this morning singing the worship songs my church sang the last two weeks. When you put anything to music, you’re bound to commit it to memory. My 6th grade math teacher taught us about fractions and percentages through several songs he wrote, and I still remember them to this day. I’m sure when you’re going through your ABC’s, you sing the tune in your head. Melodies and lyrics stick with people, and so it is important that when we pick songs to lead our congregations with, we pick songs that clearly point to the gospel and are supported by Scripture. They need to be songs that are doctrinally sound. What we think and believe and sing about God is of utmost importance, and so which songs we sing in our services is of utmost importance. 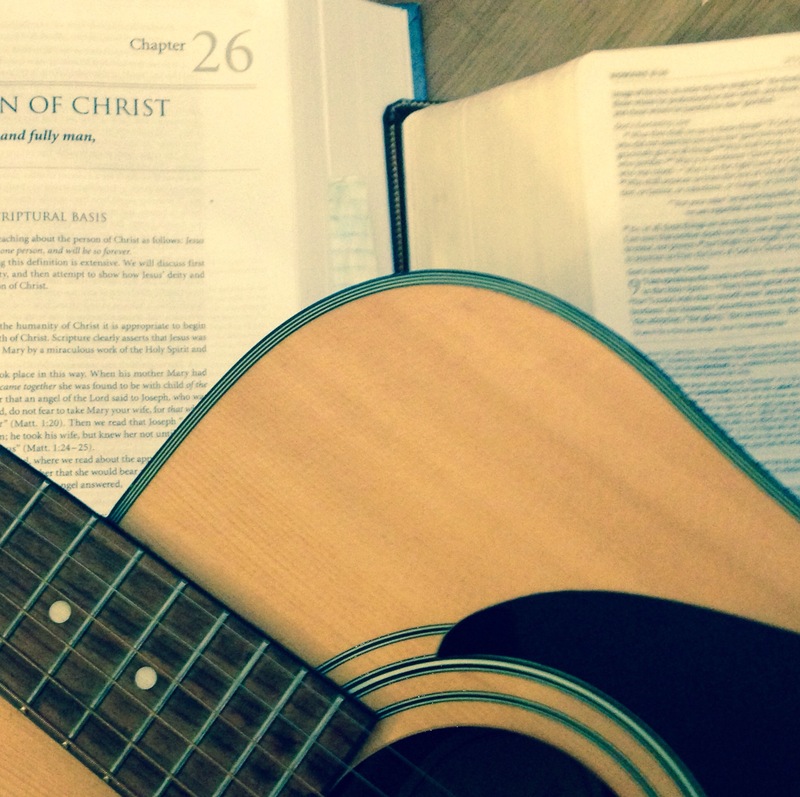 First, worship leaders should be in the Bible daily. Saturating yourself with the Word of God enables you to lead people to God and the full richness of the gospel. It also helps you see when songs aren’t biblically sound and enables you to teach people where the truths in your song come from. Worship leaders should be excellent theologians. Leading people into worship is more than being able to play the guitar and sing! You have an immense responsibility and calling to shepherd the people God has entrusted to you. It’s not a call for every aspiring musician. Go buy a book on Christian doctrine or systematic theology and study it. Things like the Trinity, the doctrine of man, and eschatology are rich biblical truths that will inform you when choosing a worship song. Knowing theology helps you see why the line, “you took the fall and thought of me above all” in the song “Above All” is inaccurate and faulty. It puts man at the center of God’s purpose, as opposed to the glory of God being at the center of God’s purpose. It takes a lot of time. It takes a lot of prayer. And this is before you even get to the practicing part! It decreases the amount of songs in your song bank. It may sound like too much, but as worship leaders, you’ve been entrusted with much! Be diligent and faithful, friends. It is not an entitlement to anyone with with a decent voice. It is a calling by God. In a black and white world, most of us live in the gray. In a black and white world, music and poetry explore the gray. Much has been said and written about the themes of religion and faith woven into the lyrics of the band Mumford and Sons, but much has also been debated about where their faith stands. I don’t want to argue about whether they’re Christian or not, but their lyrics are some of the most thought-provoking ones out there. There are echoes of Ecclesiastes where the Preacher writes that God has set eternity in our hearts, but perhaps more so, the famous words of Blaise Pascal when he wrote, “There is a God-shaped vacuum in the heart of every person, and it can never be filled by any created thing. It can only be filled by God, made known through Jesus Christ.” We try to fill the deep longings and desires of our hearts with everything we can find, thinking surely something will satisfy and fill the hole, but it’s like throwing fistfuls of sand into the Grand Canyon. You will never fill the hole. But worse, the things we try to fill the hole with actually do us more harm than good — it steals our character. Darkness may be a harsh term, and it may have dominated the things I’ve seen. But the grace that changed my heart with the welcome I received at the restart ensures I don’t stay in darkness. I know, I know. I’ve been horrible at updating this recently. There’s been less activity here than if you were watching golf on a Sunday evening. But to jump-start my return to the blogosphere, I want to share a song that has been stuck in my head all weekend. I’ve always liked Chris Tomlin. In a genre where a lot of songs sound either like whiny love songs to God (or a lover of your choice) or are theologically anorexic, Tomlin has consistently written songs that have robust lyrics that point back to Christ. They glorify God in such a beautiful way. They actually praise and worship God! Imagine that. This song is an old one that Tomlin wrote and sang, but this version has David Crowder as well, and includes an additional lyric where previously there was only humming. I was actually there at the concert when they recorded this exact version in Austin, and it was beautiful! Thousands of people lifting high the banner of Jesus Christ! Maybe it sounds corny, but my heart warms when I hear this song because I am reminded that everything my heart yearns and longs for is found in Jesus. When broken things can’t satisfy me, when people don’t live up, fail me, and leave me, when my soul groans for true relationship, when nothing in this world satisfies… As I’m waiting for wholeness and shalom… Jesus completes me! In Christ, our desires overwhelmingly meet their satisfaction. This… This is our God. Music has the ability to sometimes perfectly express our emotions and feelings. In our ups and downs, we can find a song to relate to. It’s one of the reasons why we cling to it so much. And sometimes, it can quickly turn us the other way. I’d been in a weird funk the last week and a half. In the midst of cluttering my life and schedule with stuff, I was just coasting through. And then I started listening to this song. And I can’t get enough of it. At first, it’s a song with a bit of a catchy melody. And then you listen to it over and over and the truth behind the lyrics capture your heart. The Holy Spirit testifies with your spirit the veracity of the truth of the chorus. And He urges you to live in light of it. It is simple. But so true. Christ IS risen from the dead! We are joined to Him in one family. And then the urging: Come awake! Come awake! Come and rise up from the grave! In Christ, our old selves died with Him, but now we are new creations! Thus, be a new creation! And then… the bridge. It excites me. Moves me. And instantly reminds me that joy in Christ is the call for all who call Him Savior. If you haven’t already done so, I encourage you to check out Matt Maher’s other stuff too. He’s a great songwriter and worship leader. I find myself humming this song at work or in the car. It is not a “feel good” sedative of a song. It is a reminder of the very truth that we base our lives on. Christ is risen from the grave, we are one with Him again… Come awake, come awake… Come and rise up from the grave! Music has such an un-empirical quality in the way it pulls at your heart. At your soul. The way the perfect lyric is joined to the the perfect melody. The tenderness of a musical instrument mixed with its rawness. And the result is something that cannot quite be measured in a quantifiable way. I’ll save most of my thoughts on music for another day. For now, I leave you with a song that has been pulling at me. It is a recognition of brokenness. Of our overwhelming need. It is a recognition of a Love even more overwhelming. A reminder that Love changes us to bring change to the world. What does it mean to be salt and light in the world? Listen to the song a few times. Let it sink in. Surely…. Surely we can change.